If you’re anything like us, you have probably watched every Pixar movie twice. Out of all the Pixar films, you clearly have a favorite, and we’re willing to bet a lot of money that it’s one of the Toy Story films. Whether you are truly nostalgic for the first film or you loved the third one, they’re all great. When watching these movies, most of our focus is on Andy and the toys, but it’s time we think about the supporting characters. Like Andy’s mom. She’s more than just Andy’s mother, Mrs. Davis (yeah, that’s Andy’s last name). She actually has a kind of heartbreaking story. Throughout three films, we don’t ever learn too much about Andy’s mom. Her first name is never actually mentioned. Nor do they explain what happened to Andy’s father. Did he die? Did he leave? We don’t really know, all we know is he is gone and Andy’s mom is actually a bit of a threat to the toys, as she always tells Andy to clean up his stuff or throw out his toys. There is this theory about Andy’s mom being Emily. If you don’t remember who Emily is, she was Jesse’s owner. AKA the inspiration for the emotionaly draining song “When She Loved Me” in Toy Story 2. This theory proves to be canon for a couple reasons. The first being Emily grew up in the ’60s/70s, which is the time period in which Mrs. Davis would have grown up. Though Emily’s full features are never shown, her strawberry blonde hair seems to be a very easy connection to Mrs. Davis current features. Time frames and physical makeup aside, the real kicker for this theory is the hat. It seems very likely that Andy got Woody as hand-me down. However, though he has Woody, he does not have Woody’s hat. Most fans never really noticed this at first, as Toy Story released in 1995 (when some of us were mere toddlers or kiddies in kindergarten)and then Toy Story 2 released in 1999. Andy is always shown playing around with Woody while wearing Jessie’s classic red hat. We bet you never noticed that one! But while Woody’s hat is brown with a white trim, Jessie’s hat is red with a white trim. When Jessie tells her story about Emily and that devastating montage plays, you see Jessie being donated, but Emily does not leave the hat to be donated. The theory is that Mrs. Davis is Emily and when she either found Woody for Andy, or Andy’s dad passed him down to Andy, she pulled out that ol’ red hat and gave it to him. 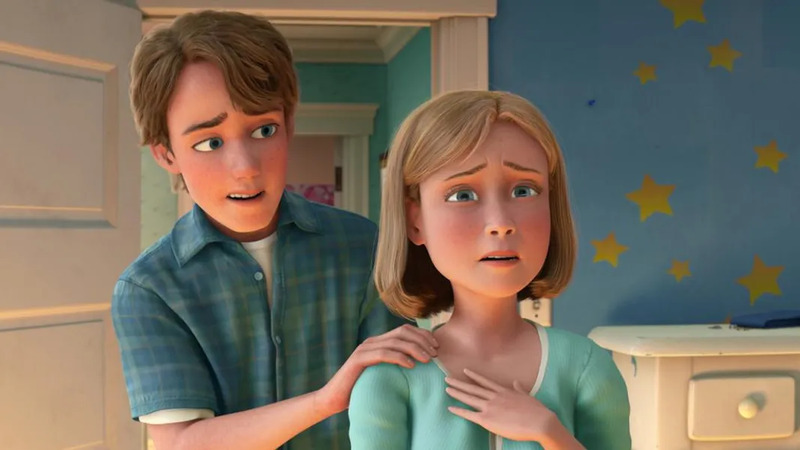 We’re not sure if we want to cry about this or binge every Toy Story movie to find out more Easter Eggs we missed because we were little kids when they released. We’ll probably do both!